No more waiting in long lines for Washington State DOL tests! Written (Knowledge)Test Walk-in hours: Tuesdays and Thursdays 10 am – 6 pm and Saturdays 8 am -10 am. Driving (Skills) Test Walk-in hours: Tuesdays, Thursdays, and Saturdays 10 am – 1 pm. We have several options available, including the use of our vehicle. Check the “WA STATE TESTING” tab below for more information. DOL Written and Road Tests are now being offered at this location. Saturdays 10 am – 1 pm. Driving (Skills) tests can also be scheduled by appointment (pre-paid only). Please call 360-412-0911. 1. Road Test 1 (one) WA State Road Test (Skills Test). 2. Road Test using 911 Vehicle 1 (one) WA State Road Test using a 911 Vehicle. The Drive Fit is a one-day, four-hour behind the wheel program on a closed course. Perfect for new drivers to help them learn collision avoidance skills quickly, and get a check on their skill level and what their vehicle can and can’t do. Client will work one-on-one with an instructor who will gauge the client’s driving abilities. In this educational experience, the instructor will give feedback on breaking bad habits, ideas on how to adapt to any physical limitations and assess safety concerns. *We have the right to refuse service to anyone at any time. STUDENTS ARE EXPECTED TO PARTICIPATE IN ALL 15 LESSONS. ANY ABSENCES (MAX OF 3 PER DOL) MUST BE MADE UP BY ATTENDING THE SPECIFIC LESSON MISSED. FAILED TESTS (SCORING LESS THAN 80%) MUST BE RETAKEN BEFORE COURSE COMPLETION. BY STATE LAW, A DRIVING SCHOOL CAN’T ENTER A COMPLETION IN LESS THAN 5. THREE (3) DRIVES MUST BE COMPLETED BY THE STUDENTS LAST DAY OF CLASS. 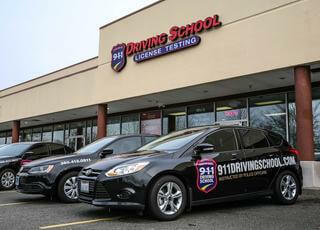 BOTH, THE STATE OF WASHINGTON AND 911 DRIVING SCHOOL BELIEVE CLASSROOM AND BTW EDUCATION SHOULD BE INTEGRATED. $250 FEE IS CHARGED IF THE STUDENT FAILS TO COMPLETE DRIVERS EDUCATION WITHIN 90 DAYS OF COMPLETING THEIR COURSE. FAILURE TO COMPLETE THE COURSE WILL RESULT IN HAVING TO TAKE THE CLASS OVER AGAIN. PARENT INVOLVEMENT IS CRITICAL FOR THE STUDENT’S SUCCESS. 50 HOURS OF SUPERVISED DRIVING IS REQUIRED BY WA STATE PRIOR TO RECEIVING A DRIVER’S LICENSE. IF PARENTS REFUSE TO PRACTICE WITH THE STUDENT AND THE STUDENT IS NOT ABLE TO COMPLETE THE TASKS OF EACH BTW LESSON, PARENTS MAY NEED TO PAY FOR ADDITIONAL DRIVES IN ORDER FOR THE STUDENT TO MOVE ON TO THE NEXT DRIVE LESSON. THIS CAN BE AVOIDED BY PARENT INVOLVEMENT. ATTENDANCE AT ONE OF OUR “PARENT NIGHTS” IS REQUIRED. ALL STUDENTS AND PARENTS ARE RESPONSIBLE FOR KNOWING AND TRACKING THEIR INDIVIDUAL DEADLINES, ABSENCES, AND COURSE PROGRESSION. BTW Practice: It is 911 Driving School’s practice to have two students in the instructional vehicle at all times. There are instances when this is not possible. By signing this form, you give the 911 Driving School permission to conduct BTW (Behind the Wheel) training in a one-on-one setting. Behavior: Students are fully accountable for their conduct. Students can be dismissed from the course for misbehavior, cheating (whether sharing or receiving answers), being under the influence of drugs, including alcohol, during any of the instructional phases, misuse or abuse of Traffic Safety Education equipment, repeated and willful violation of traffic laws, failure to complete assigned work and multiple failed tests without a refund. Attendance: Classroom and BTW instruction will be completed in not less than 30 days and not more than 3 contiguous months. Enrollment will not be allowed after the third class has started. Students must be 15 years old by the first day of class. No more than three absences permitted. All absences and failed tests (scoring less than 80%) must be made up. Students can be dismissed without refund from the course for excessive tardiness or unexcused absences. Certificate: Upon successful completion of all tests and activities required for our program and upon full payment of tuition and fees, a Traffic Safety Education Completion will be entered with DOL. Extra behind the wheel time, whether desired or required, is $85 an hour. Organ Donor: Washington State requires our course to include information about the Organ Donor Program. This portion of the course is optional. Completion of this traffic safety course does not guarantee student(s) will pass the DOL exam for licensure. Private Driving Lesson (Adult or Teen) 1 Hour Private Driving Lesson for Adults or Teens. We customize your lesson to your skill and confidence level.